What is Fire Protection? Grunau Company offers fire protection services. Protecting lives and property is everyone’s business. Whether you are a CEO or an apprentice, familiarity with fire protection systems and their functions is essential. 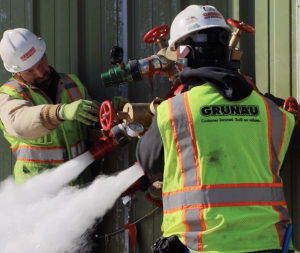 Grunau employees work on a fire pump test. Interested in protecting your business from fire? Contact a fire protection specialist at 800-365-1920 today. There are several simple ways to protect your business from fires. Ensure your overhead sprinklers are in working order, and that your fire extinguisher inspection is current. Be sure to keep paths clear in working areas, and post a clear, easy-to-read fire exit map for your employees. According to FEMA, nearly 30% of nonresidential fires in 2016 were caused by cooking. Additionally, between 2007 and 2016, cooking was the leading cause of nonresidential building fires for the 10-year period. There was an 18 percent increase in nonresidential cooking fires in that time. The best way to avoid a cooking fire is to always attend to the fire- never leave the kitchen when you are cooking. Always keep cooking appliances in good working order, and be sure to have them checked and serviced by a professional yearly. Additionally, ensure a working fire alarm is located near (but not in) the kitchen. This prevents the daily smoke and/or steam from triggering the alarm. Grunau offers 24/7 remote fire alarm monitoring for your business. Contact us at 800-365-1920 to speak with a fire protection professional today. Another way to protect your business is to get a fire safety inspection on your property. The inspector can find areas of improvement and point you in the right direction. They will look to see if everything in your business is up to fire code. ← What is the difference between HVAC and AC?